The Muddler Minnow is a popular and versatile artificial fly of the streamer type used in fly fishing and fly tying. The Muddler Minnow was originated by Don Gapen of Anoka, Minnesota in 1937, to imitate the slimy sculpin. Gapen was the son of resort operators Jesse and Sue Gapen who ran the Gateway Lodge Resort on Hungry Jack Lake in what is now the Boundary Waters Canoe Area Wilderness in the 1920s. In 1936, the Gapens opened a second resort, the Chalet Bungalow Lodge, on the Nipigon River in Ontario to be operated by Don. In 1937 Gapen developed this fly to catch Nipigon strain brook trout, Ontario, Canada. The Muddler, as it is informally known by anglers, was popularized by Montana, United States fisherman and fly tier Dan Bailey. It is now a popular pattern worldwide and is likely found in nearly every angler's fly box, in one form or another. The versatility of the Muddler Minnow stems from this pattern's ability to mimic a variety of aquatic and terrestrial forage, ranging from sculpins, to leeches, to grasshoppers, crickets, spent mayflies, emerging green drakes, stonefly nymphs, mice, tadpoles, dace, shiners, chubs, and other "minnows," along with a host of other creatures. 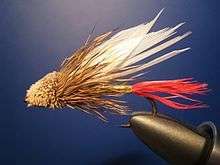 There are limitless material and colour variations, however the essence of the Muddler Minnow is a spun deer hair head. While each Muddler may differ in colour or profile, all true Muddlers have a fore-end or body of spun deer hair that is clipped close to the shank to provide a buoyant head. Typically there is an underwing of squirrel hair and a wing of mottled secondary turkey feather. Often the fly body is made of gold/silver Mylar or tinsel wrapped around the hook shank. Marabou may be tied in as a substitute wing for colour and lifelike movement through the water. The head may be weighted or unweighted, according to the style of fishing, the target species and the intended imitation. The muddler has served for the basis of several patterns, including the Spuddler, Muddler Hopper, Mizzoulian Spook, Searcy Muddler, Keel Muddler, and so on, but even in its simplest and original form, it remains a very effective fly. Besides the traditional deer hair, many Muddlers are tied today with heads made of antelope, spun wool, dubbing, chenille, or other materials. Whether they should properly be called Muddlers is a moot point. Muddler patterns are generally effective when fishing for any freshwater or saltwater species in cold or warm water environments. This pattern is most often used to catch all species of trout, steelhead, Arctic char, large grayling, both Atlantic and Pacific salmon, taimen, lenok, smallmouth and largemouth bass, pike, redfish (red drum), tarpon, and almost anything else that swims. Effective retrieval tactics include stripping the floating Muddler across the water surface rhythmically, imparting a "wake", or allowing the Muddler to sink and twitching or pulsating it against or across a river's current. An unweighted Muddler will float and appears as a hopper, moth or struggling mouse. With a tiny piece of split shot in front of it (or an intermediate flyline) the Muddler can be made to swim slowly over weedbeds and shallow gravel bars. With more weight, the Muddler can be stripped wildly in the shallows to imitate and alarmed baitfish, or allowed to settle in deeper water. When weighted—either on the fly itself, with split shot, or a sinking leader or line—the Muddler my be fished right on the bottom to effectively imitate a sculpin. When imitating sculpins, Muddlers must be kept right on the bottom and fished slowly, with occasional fast strips of maybe a foot to a yard, as if trying to escape a predator. ↑ Hughes, Dave (1999). Trout Flies-The Tier's Reference. Mechanicsburg, PA: Stackpole Books. pp. 143–146. ISBN 978-0-8117-1601-7. ↑ Whitelaw, Ian (2015). "Muddler Minnow". The History of Fly-Fishing in Fifty Flies. New York: Stewart, Tabori and Chang. pp. 114–117. ISBN 9781617691461. Soucie, Gary. Muddler Magic: How to Tie and Fish Muddler Minnows and Other Mostly Muddler Patterns. Frank Amato Publications (in process). Valla, Mike (2013). "Don Gapen (1907-1986)". The Founding Flies-43 American Masters Their Patterns and Influences. Mechanicsburg, PA: Stackpole Books. pp. 140–145. ISBN 9780811708333.